Every operating program in the unit is controlled with mutual links and communications to prevent every possible error, so it introduces the maximum safety, such as input voltage warning, reverse polarity protection and Lithium cell-count input error warning. This charger can accept three types of Lithium batteries - LiIo, LiPo and LiFe. They have different characteristics by their chemistry. You can select any one of them that you are going to process before the job. For their specifications, refer 'Warnings and safety notes' section. Temperature limit : The temperature of the battery on charging will rise by its internal chemical reaction. If you set the limit of temperature the process will be expired forcibly when the limit has been reached. Input power monitor : To protect the car battery using as input power from being damaged, its voltage always being monitored under operation. If it drops below the lower limit, the process will be ended automatically. Perform 1 to 5 cycles of charge>discharge or discharge>charge continually for battery refreshing and balancing. 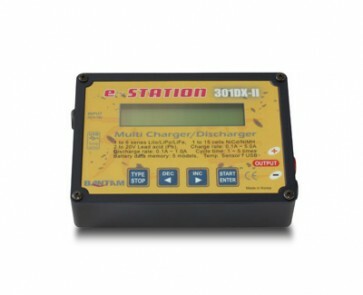 For technical expert, 301DX-II offers PC based program can analysis the characteristic of the battery by USB port. It shows a graph of voltage, current, capacity and temperature curves. It also shows the individual voltage of each cell in the Lithium battery pack.